These 7 painted furniture trends will help you update your furniture with new and classic finishes. 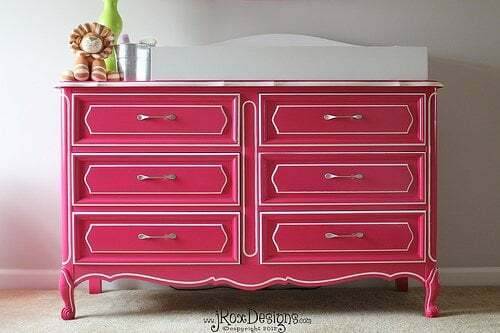 Spectacularly painted furniture has that extra pop, and fits in almost any style. I've written tutorials before about painted furniture using distressing, milk and chalk paint. Let's look at what is trending. 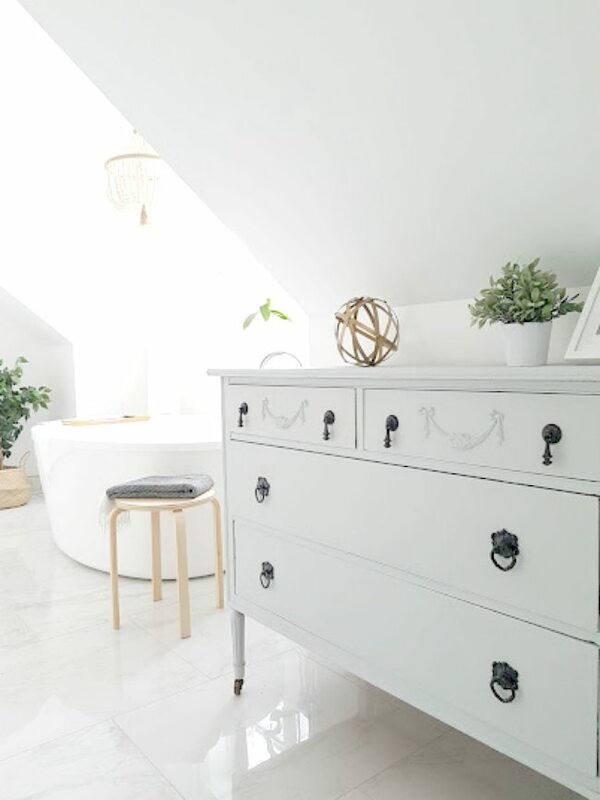 This post covers new painted furniture trends with videos and photos below, links to tutorials and how-to-guides. 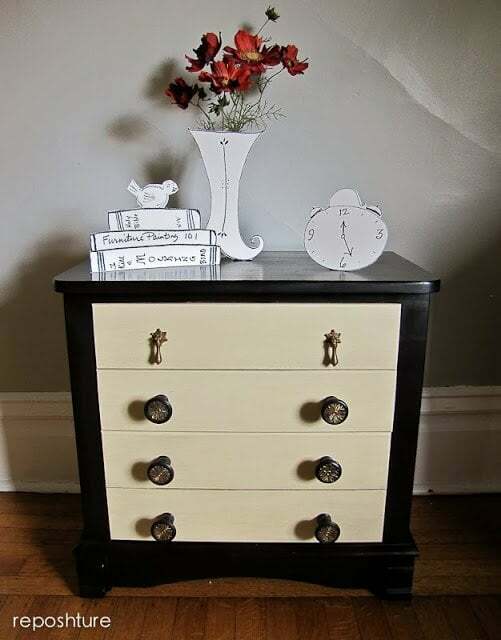 From perfect flat matte, gold detail, spray paint, milk paint and chalk paint. These techniques can be used on new or old furniture to create the most amazing painted furniture looks. A major trend is painted furniture with smooth, flawless matte finishes. In particular, dark, even black matte painted furniture is seen more and more. 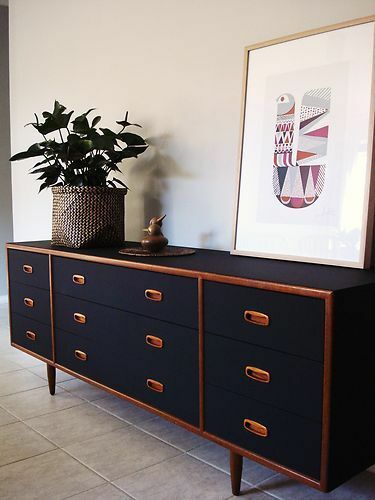 The wood in the mid-century cabinet above has an almost copper effect against matte black paint, but matte works well for light to white furniture as well. 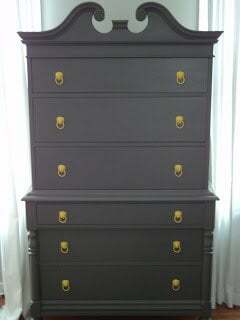 The highboy makeover below from The Richmond Thrifter using standard Behr enamel paint in a flat finish looks amazing. 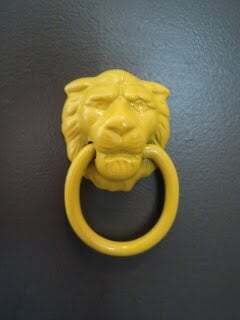 The tutorial includes details on how traditional lion brass pulls were converted to bright yellow lacquered pulls. 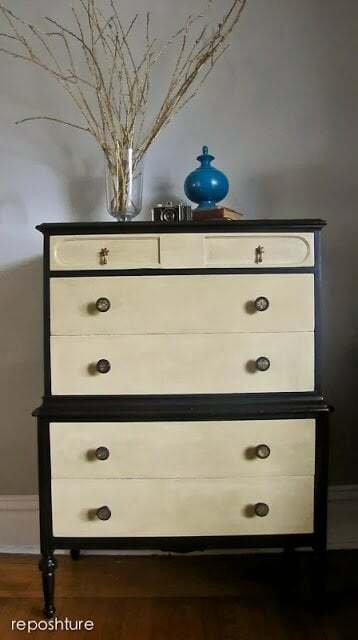 Very stylish!Source: Richmond ThrifterThe smooth matte finish makes a big difference to this highboy, while the bright yellow pulls really pop, transforming it into a high end piece. If you are a fan of gray painted walls, pieces like these really stand out and ground your room. Gold, copper and silver metallic paint is peeking into everything; from the top of cupcakes and desserts to hints in painted furniture. Nothing ostentatious. In fact, deliberate restrain is what is needed to highlight carved areas or ridges with the smallest amounts of gold. 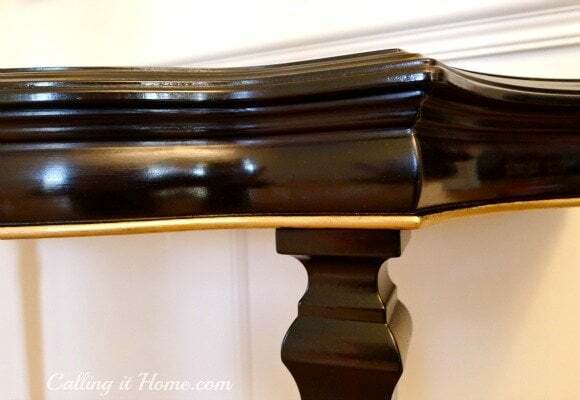 This beautiful wall or hall table below, from Calling It Home has a makeover, just by adding a touch of gold with a gold leaf paint pen to the ridge. Or this clever makeover from Centsational Girl using Annie Sloans Chalk Paint in ‘French Linen’. You don't need to use a primer with Chalk Paint or Milk Paint (read my tutorial on Chalk Paint and Milk Paint for more tips) only if you use latex or enamel paint. Source: Centsational Girl Removing flat, dull gold or brass and adding gold paint can instantly update any piece. Sometimes you need a splash of bright color to add something really special to your rooms. There is a great tutorial for the French Provincial dresser below at JRoxDesigns. Don't you love this daring piece? I think the white sets it off perfectly. If you prefer the glossy look, then red is big, and stripes are huge like this chest from Petticoat Junktion, where details and how to's can be found. "Pure Red Hi-Gloss Behr ...what a beautiful color. 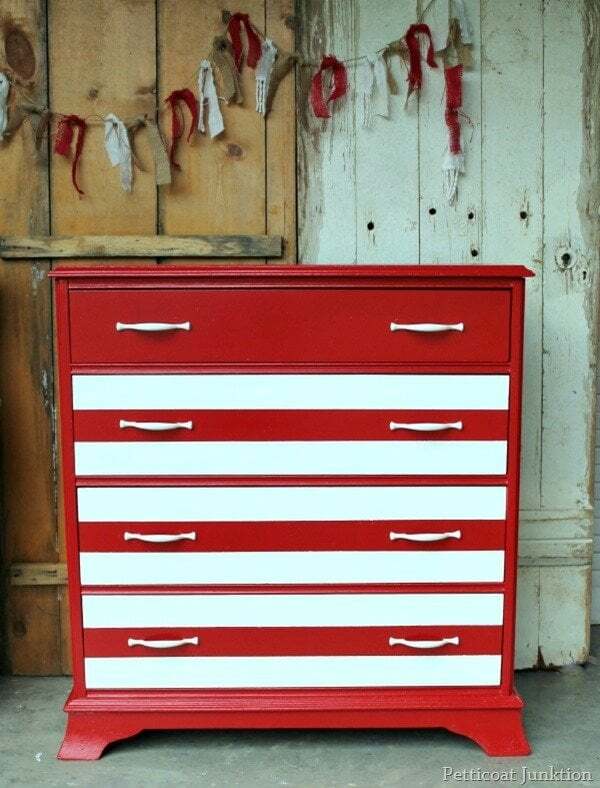 I painted this chest red and added white glossy stripes on the drawers for contrast. Great Makeover!" Dark to black colors are staying strong. Here is another dark painted furniture tutorial for this wardrobe at the Little Green Notebook for this piece below at How to Paint (and Even Wallpaper!) IKEA Furniture - Little Green .... It's an IKEA wardrobe, transformed, with lots of paint and wallpaper! Looks stunning and in true IKEA fashion, built for storage! Spray paint can give a smooth, glossy finish that makes pieces look bold and strong. These updated cabinets below were created with spray paint. The gold geometric pulls create a striking contrast. Most people are afraid to use spray paint. Like anything, there are short cuts and tricks and this tutorial makes it look easy.As she says, "Every DIYer knows paint has the power to transform anything. Spray paint happens to be one of my favorite tools especially on small pieces of decor, but it can work really well on furniture too... The color on the body is Rustoleum’s Gloss Black and the legs are painted with Liquitex Antique Gold (both spray paint). 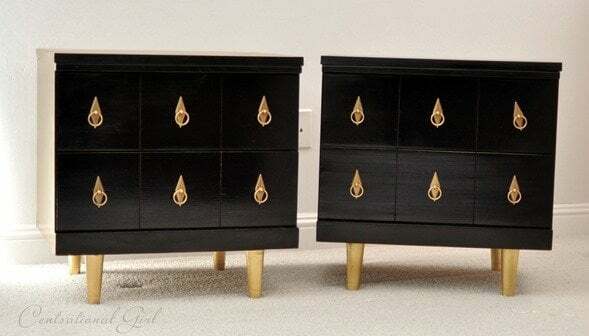 The new brass ring pulls with a diamond back plate are from Lee Valley and so gorgeous – note they also come in a slightly large size, and they are absolutely perfect for these two chest of drawers.If you want to try out spray painting, you can find the full tutorial here. One problem with using older pieces is finding two of the same. One way around it to to unify them by painting them the same colors. These chairs are all different but they tie in beautifully by being painted the same shade of white. Reposhure has the answer, 'Keep the pop of color as an undercurrent on your new piece!' The different size and style pulls at the top, pull the eye upwards, making the pieces look less heavy and serious. 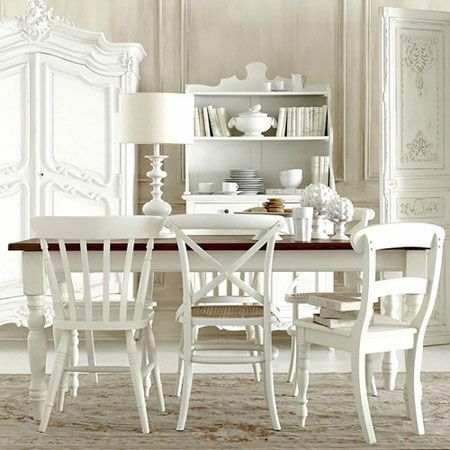 Distressed furniture is a design style that is now established and here to stay. It's often called by other names like shabby chic or rustic. Most pieces are new; altered by distressing to change the look completely. 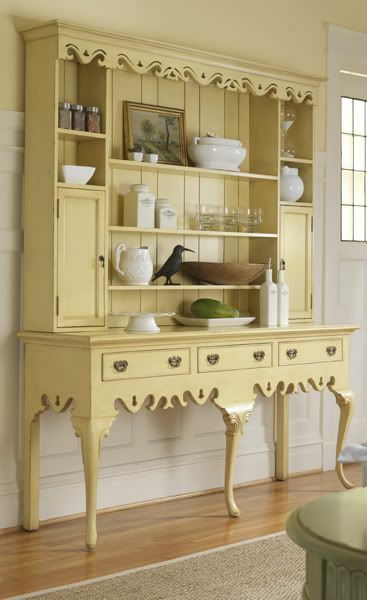 The most common way of aging or distressing painted furniture is by striking it with anything from a hammer chains. To create scratches or gouges, you can hit the furniture repeatedly with nails and screws embedded into a wood plank. It sounds a little harsh, which is probably why most people take the less strenuous route and sandpaper the edges to show either the wood or previous colors underneath. What you do next is up to you, but the trend holding strong is the use of chalk paint and milk paint to blend old and new. 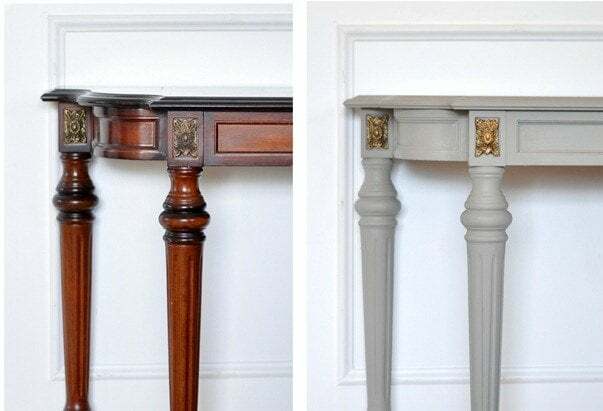 People really love working with milk paint and chalk paint and when you see the great results you can understand why. 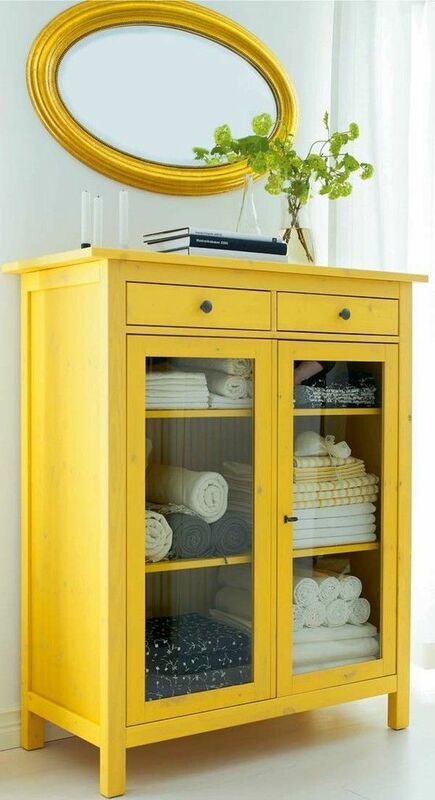 Painted Furniture is the secret to creating a whole new look. It's about creating interest and contrast. Here are two easy videos on chalk paint to see how you can easily transform your furniture and another two below - one on Annie Sloan's chalk paint and the second on how to antique furniture. To look authentically aged use a combination of hammer, mallet or chain links to give your piece character. A less dramatic method is to sand pieces so they appear worn at corners, edges, near pulls and handles. This shows different layers of paint colors underneath. 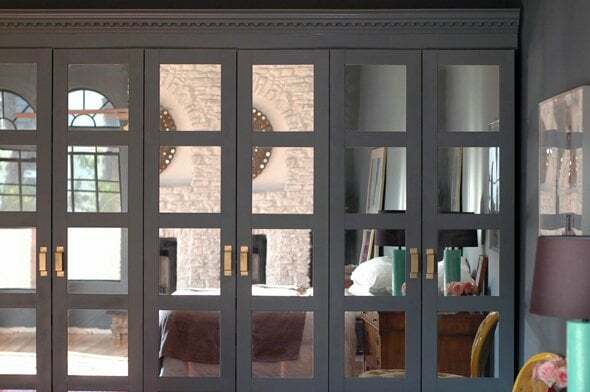 Flat paint colors are used, after all, glossy means new.Distressed furniture allows paint colors underneath to show through, creating a worn layered effect. There is usually a dark undercoat. 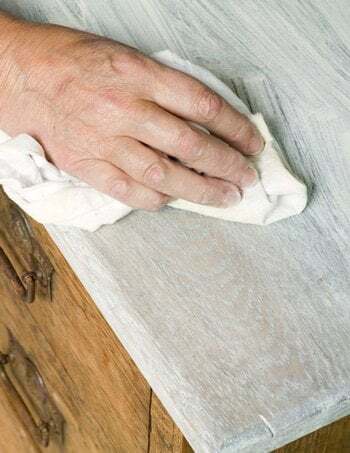 Additional coats are applied, finishing off with a final lighter, often white, layer.When the final lighter color is painted, sand back at the edges, corners, pulls and handles to allow the dark layer to peek through. Add a final coat of wax to protect your furniture and all your hard work. Annie Sloan isn't the only chalk paint in town. There are other good chalk paint products. 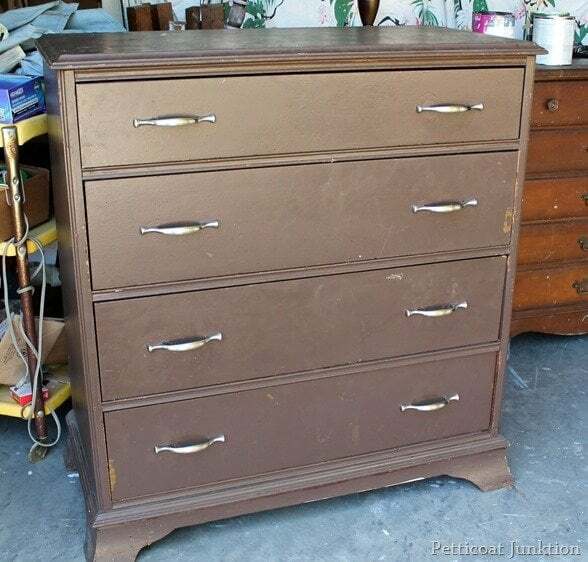 Don't ignore milk paint either, which can also create totally unique looks. Tip: Let your furniture dry for at least one or two days or the paint comes off too easily. If you're worried about color choices, surf Pinterest or Google to see a style or shade you love. Painted furniture was often lighter like light blue and white, but now from glossy red, black or lime, color is trending. For a reclaimed wood table finish, follow the steps below. Its a little messier with an extra step to darken the wood, more than once, using a vinegar wash but this is a great look if you have the time. Make oxidation mixture. Add small pieces of a steel wool pad into a glass jar, then add vinegar. They will take 3-4 days to dissolve. Then its ready to use. Use stripping gel to remove any varnish or old finish on your piece. Remove with a metal scrapper. Make sure all the old finish is removed adding more stripper if you need to. Wash down the surface with mineral spirits. Allow to dry. Sand until the surface is smooth. Use a damp rag to remove dust. Apply your vinegar solution. Allow to dry. You may do this more than once depending on how dark you want your wood finish to appear. 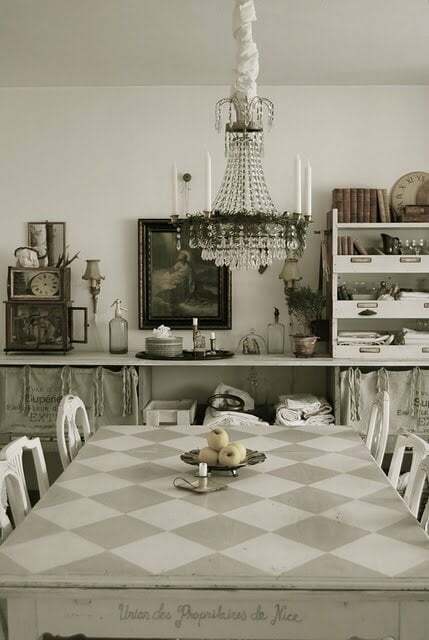 Apply your white wash, (you can use milk paint, chalk paint or water based paint), wiping away excess as you go. Allow to dry. Sand obvious paint or brush strokes. Seal with linseed oil, wax or polyurethane. To freshen your piece back to wood, simply use stripper to remove the old layers. Next sand and re-finish with a stain that matches the original wood or your other furniture. Then seal the piece, to protect it. You can use an oil finish, clear lacquer, polyurethane, or varnish for protection. Could you do a segment on kitchen updates. Did you have a look at some of the articles already there - some are ideas but some have painting looks too for kitchens? I'm doing my room in a mix of western and native american theme and colors. Maybe you can directly me to segments on thus style and how to refurbish my furniture in the room with chalk paint in this theme. I've collected old steer horns and old leather halters not usable on my horse but great to make wall plant hangers. (clearing out my old tack and saddle blankets has been a great help decorating) any help and suggestions would be great. I can't say I am an expert in this area but I love the idea of using your collection of old steer horns and leather halters to base your decorating around. 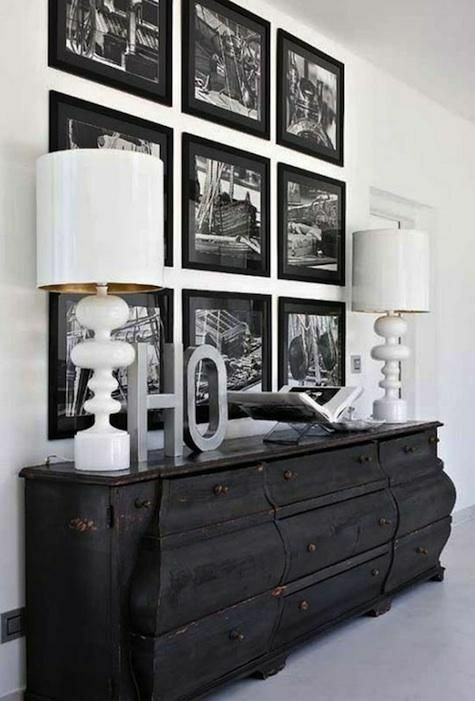 If you go to these links https://decoratedlife.com/travel-mementos-in-your-home-decor/?hvid=5p2Zof and https://decoratedlife.com/photos-on-canvas-photos-on-wood/, I think you could get some inspiration, particularly when using fabulous pieces like the ones you've got. In particular, there are some images there mixing up photos with items... you could forget the images completely and work out how to create wall galleries in some areas and disperse them in others so they don't dominate completely. Sounds Great!! In terms of sing chalk paint, I think once you have decided how you might use pieces, the way you will use chalk paint will become clearer to you... some pieces might look totally rustic, others using dark wax for an antique look and others sleek. Contrasting with sleeker or more modern finishes could be a great way to highlight your pieces.. unless you want a total farmhouse look. Lots of great choices! Enjoy the journey! Happy New Year! This is not one of my pieces (I have tried to find the source but even now cannot). It has from memory a mixture of Annie Sloan's Lem Lem + Chateau Gray, the stencil work was in white and the whole piece was brought together with a dark wax. 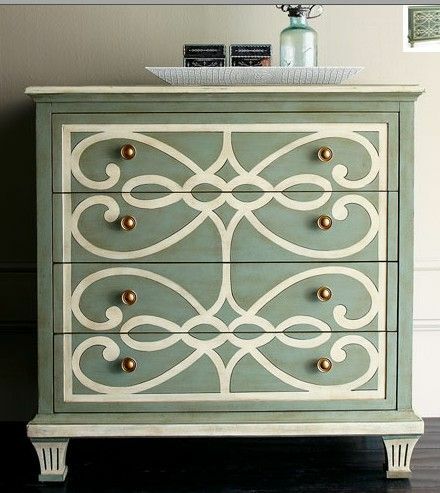 I love the greenish chest with the cream swirls. I was wondering if it was a stencil that was used. If so, would you know where I could purchase it. great to hear from you. As far as I know they are thin pieces of wood, detailing the cabinet but you could do it with a stencil. Looks great! but I am sure you could find others or even make your own. so glad I found you as retiring out to the desert & buying a large barn shed & collecting (pinterest ) ideas to save money on my existing furniture! welcome! I will do my best to help you where I can! Good luck with your retirement to the desert. Yes, use your existing well-loved furniture to make it a real home. I opened this pin to find out what you were doing with the white wash on the table or cabinet top. Can you help find the rest of the story? I'm trying to redo my island top. Is there a book on techniques?